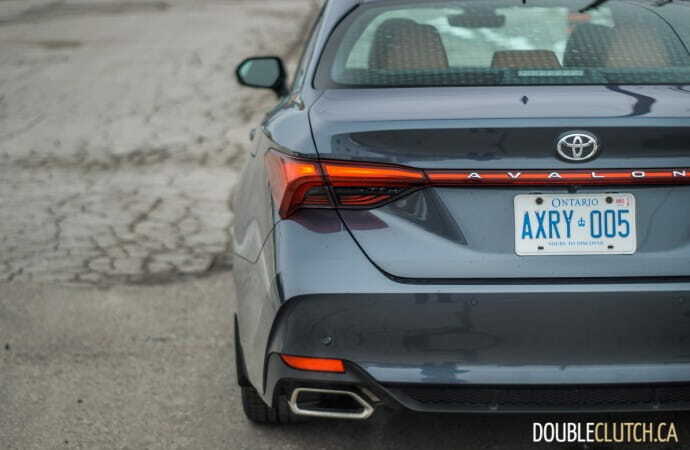 Since the nameplate’s inception in 1995 as a spiritual replacement for the pre-Lexus, Supra based rear-drive Cressida, the Avalon was always synonymous with a cushier, soulless form of transportation for octogenarians. 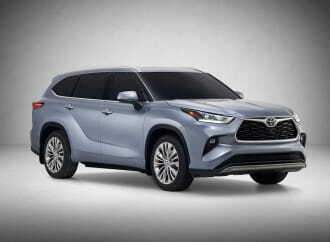 Long thought of as a Japanese contender to America’s Buick, a fresh Toyota New Global Architecture (TNGA) platform for 2019 aims to add more flavour to the driving experience. It already underpins the current Toyota Camry and Corolla Hatchback (reviewed here), which also handle significantly better than their predecessors. 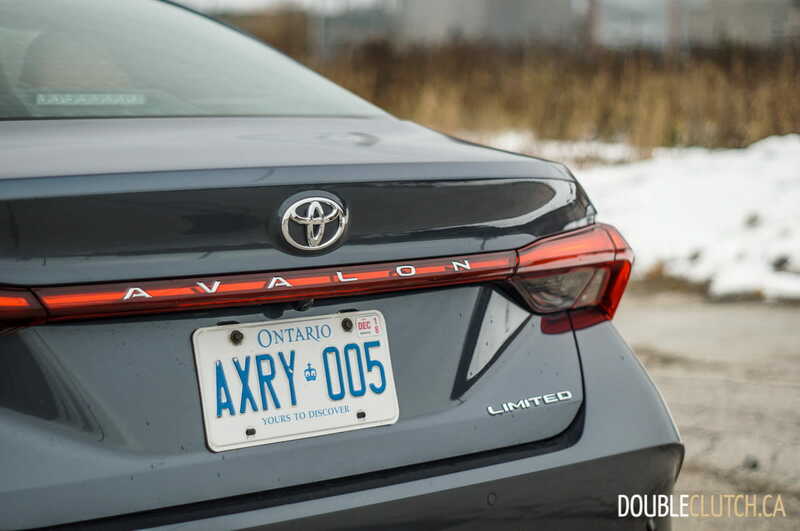 The Avalon starts at a base price of $42,790 for the base but sporty XSE trim, but the Limited test car came in at $47,790. 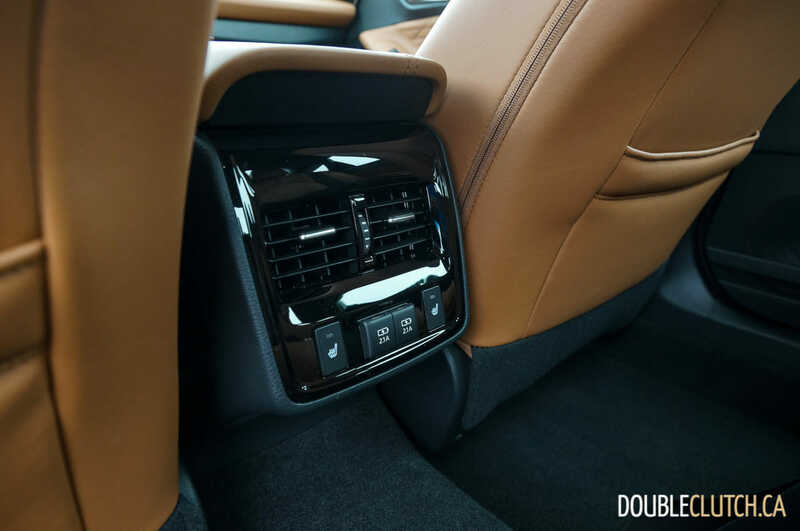 All trims get sweet sounding 14-speaker JBL premium audio, Qi wireless phone charging, dual zone climate, power driver and passenger seats, power moonroof, LED headlights, and 19-inch alloy wheels. 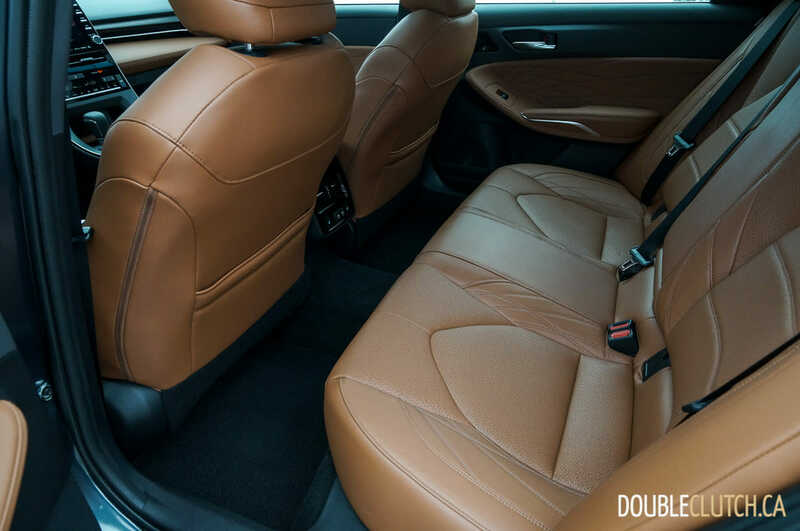 The Limited ups the ante by adding a 10-inch head-up display, a bird’s eye view monitor using the camera system, driver’s seat memory, changes the SofTex synthetic (but good) leather to semi-aniline premium leather, and adds ventilation to the front heated seats. 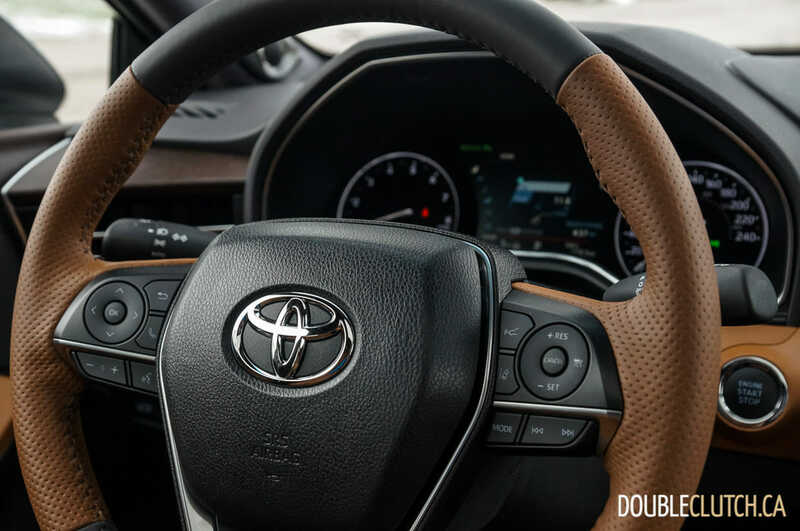 The steering wheel gains heating, and real wood trim gets added to the dashboard. 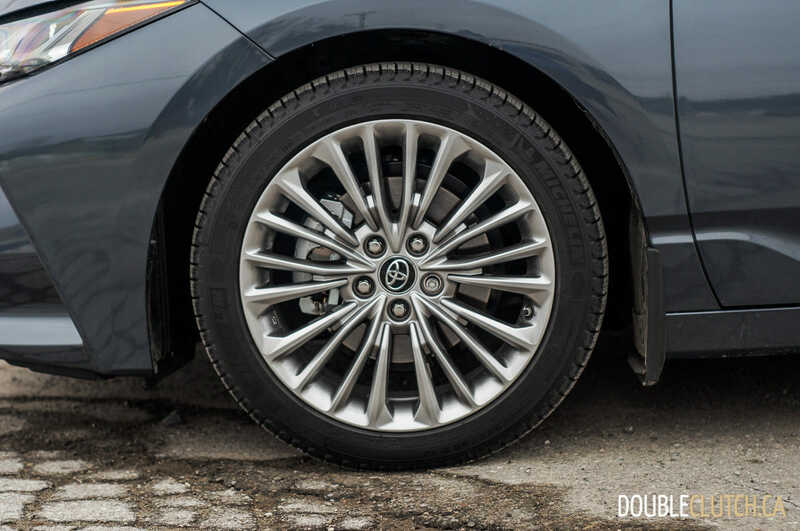 In a nod to more stately and less sporty driving, the Limited drops the XSE’s 19″ alloy wheels in favour of softer riding 18-inch units with extra tire sidewall cushion, and also replaces the sport tuned suspension with softer springs and dampers. 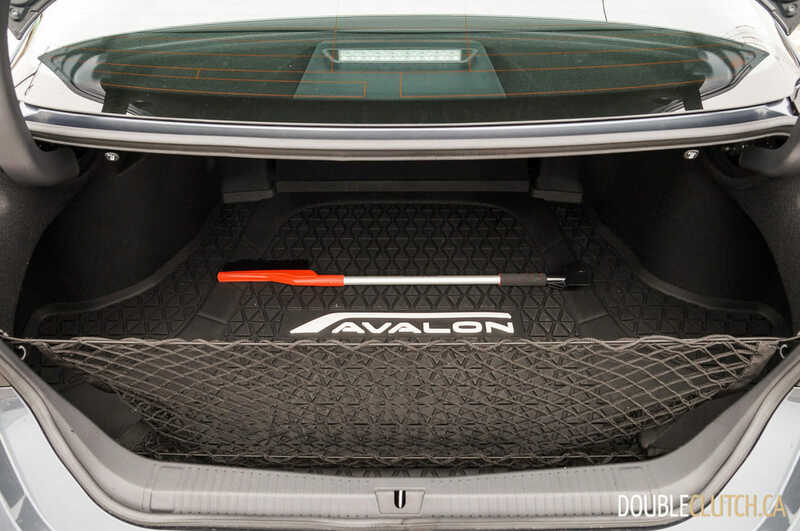 In practice, this actually helps out the Avalon in terms of ride and handling balance. 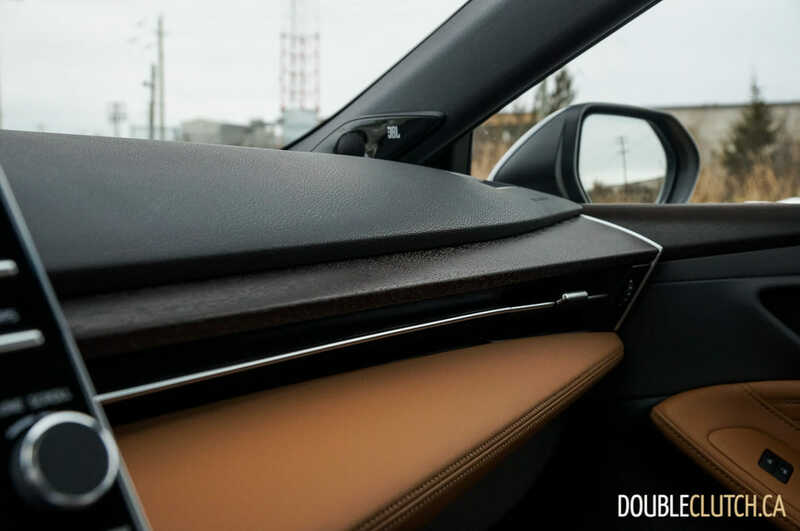 Out on the open road, the 2,870 millimetre (112.9 inch) wheelbase helps keep things smooth, and the ride quality is on the firm side without being harsh. 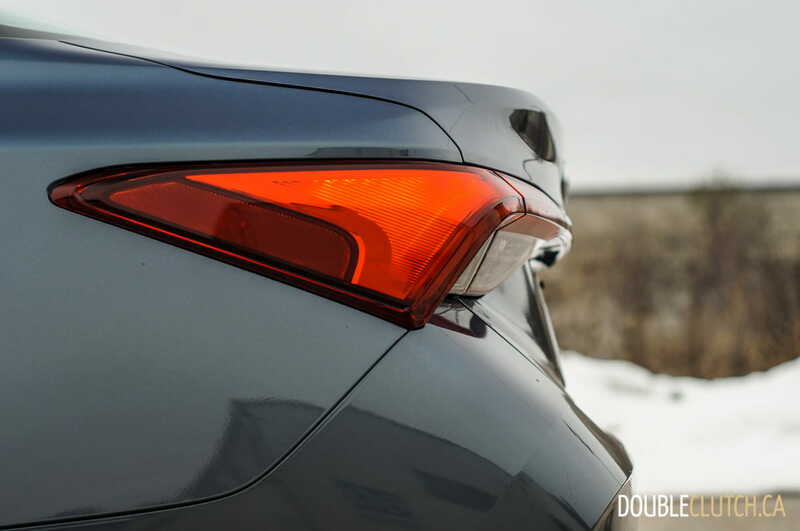 Body control and damping is excellent, with no float or secondary motions over bumps. 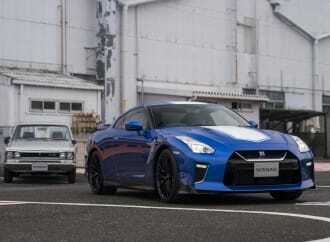 It’s more reminiscent of European style of ride as opposed to a Japanese or American one. 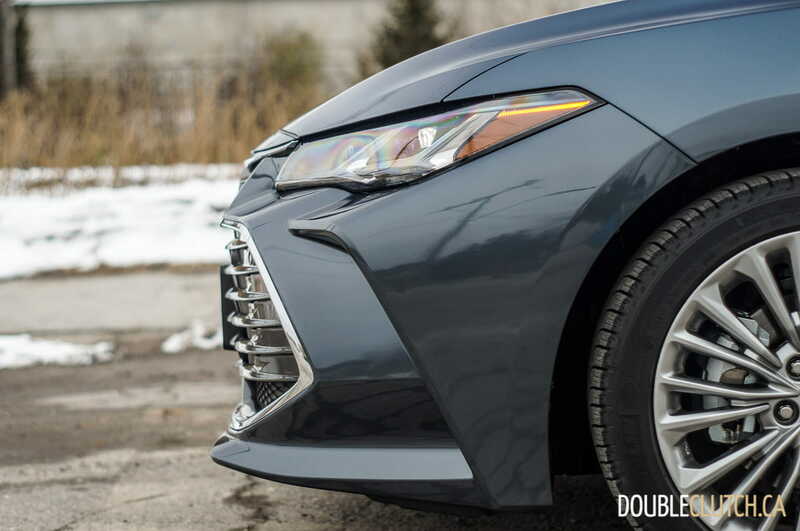 Taking a spirited run around highway on and off-ramps in the 2019 Avalon highlights the balance even better, with relatively heavy steering that inspires more confidence than any Avalon before it. 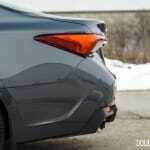 Turn-in response is sharp and grip levels are higher than expected. 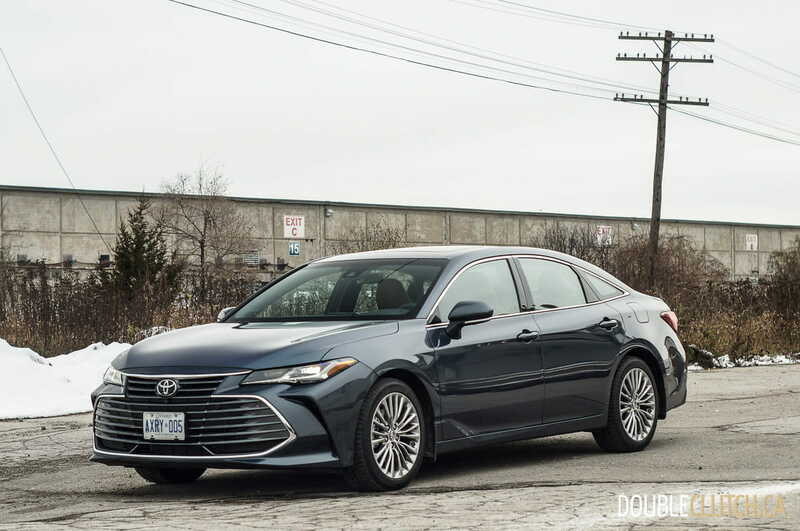 One has to push the car’s limits pretty hard before mild understeer starts to kick in – and this is with the test car equipped with winter tires that don’t fare as well in dry weather performance driving scenarios. 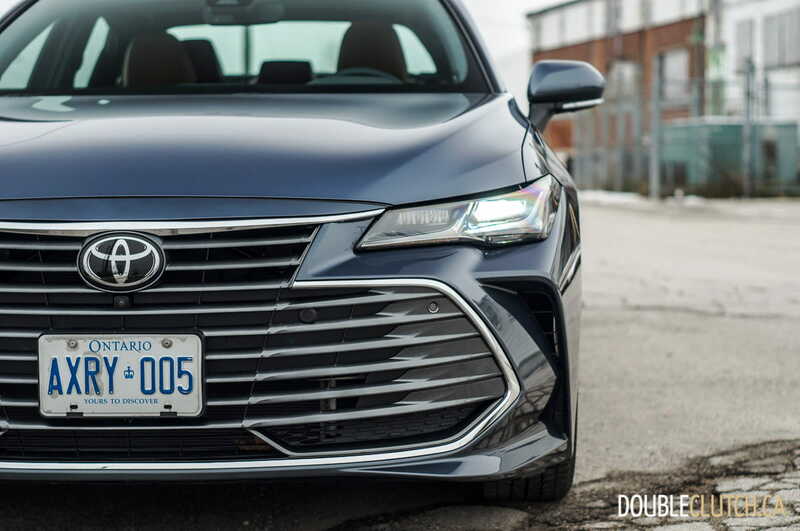 Compared to a firmer Avalon XSE or in-house competitor Lexus ES 350 F Sport, the Avalon Limited is the best mix of ride quality while maintaining handling. 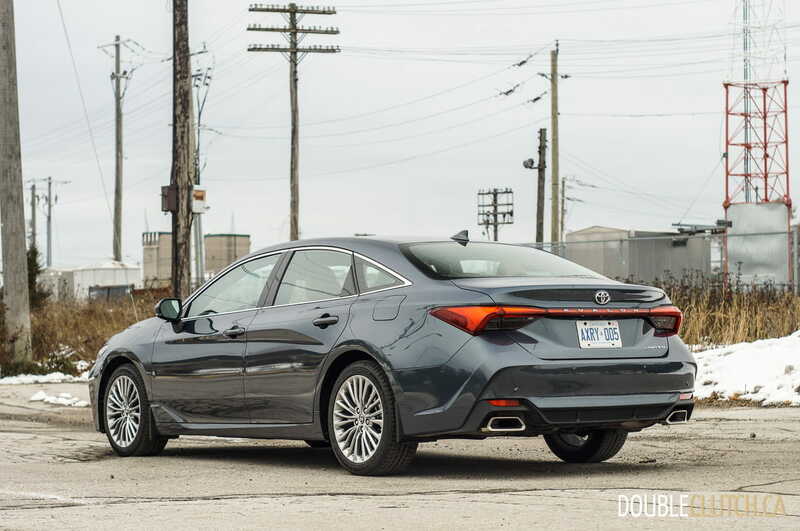 Compared to others, the Avalon is very much like the 2018 Buick Regal, which also beats expectations on front-drive premium midsize sedan handling. 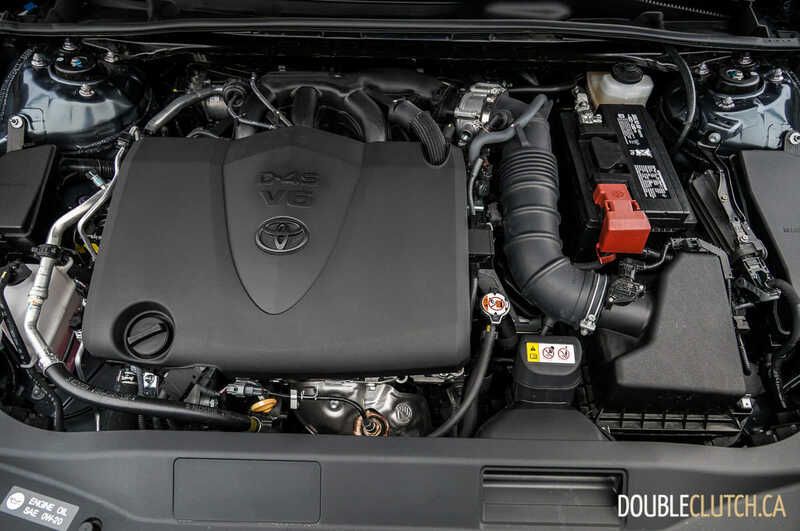 Providing motive power for all trims of Avalon is an updated 3.5-litre V6 engine which now gets added direct fuel injection on top of conventional port injection. 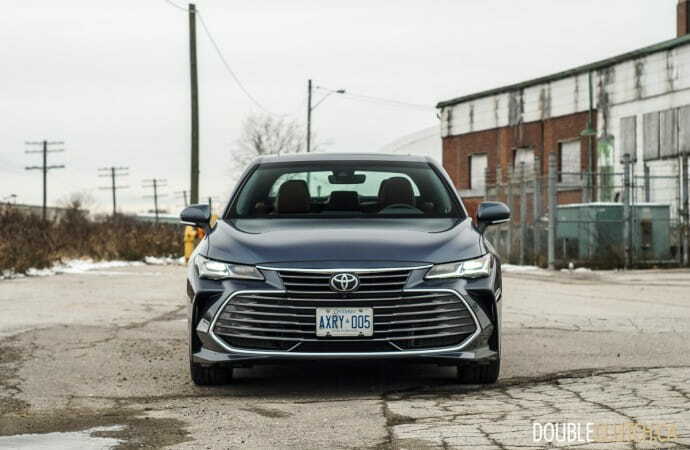 Shared with the new Camry (reviewed here) that’s also on the TNGA platform, it puts out 301 horsepower at 6,600RPM and 267 lb-ft of torque at 4,700RPM. 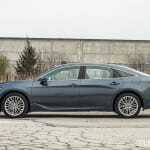 It maintains the same great midrange punch and silky smoothness as in the past, and lets out a nice soundtrack as it sweeps through the rev range. The naturally aspirated throttle response is instantaneous, and isn’t dulled down by the use of smaller displacement engines and turbochargers that take time to spin up. 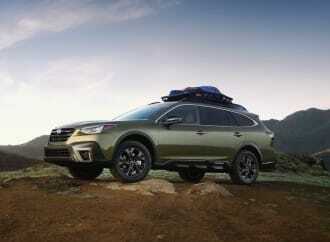 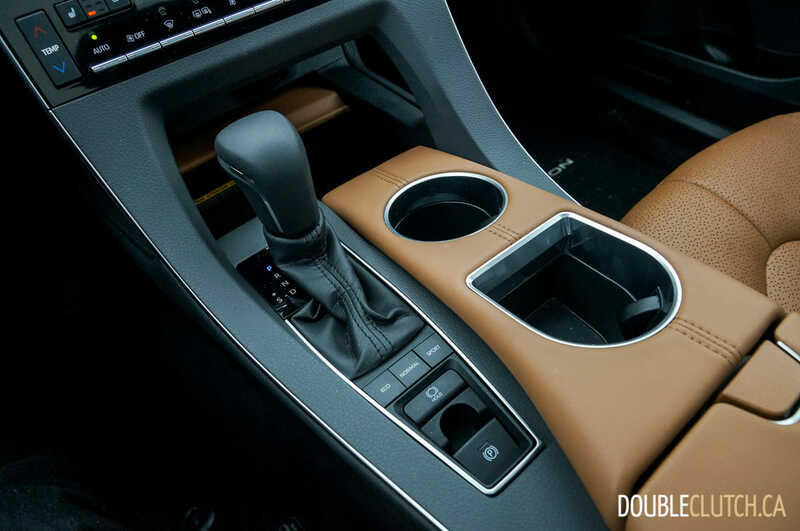 Only one transmission configuration is available – a new eight-speed automatic does a good job at shifting duty, with crisp shifts and minimal gear hunting. 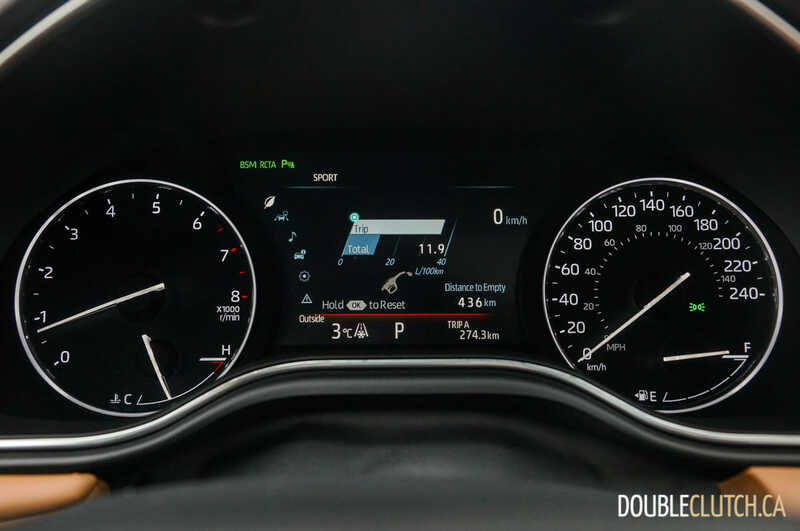 The gear ratios are biased toward more economical driving, with first, second, and third gear being fairly tall. 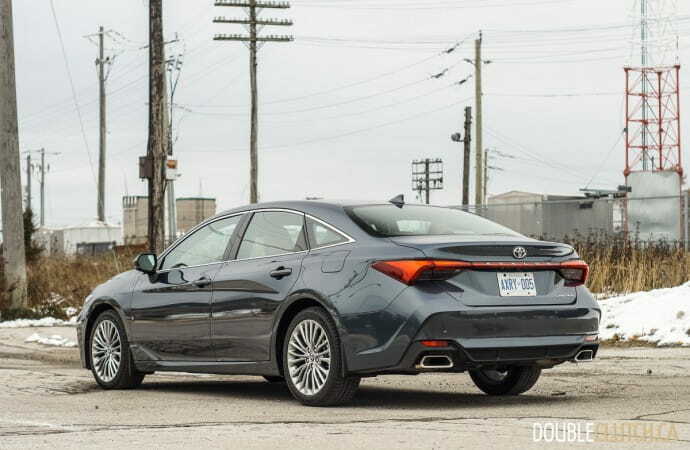 The V6 has enough torque and response to make up for this however, and fuel economy stays reasonable as a result, even without the move to a boosted four cylinder. 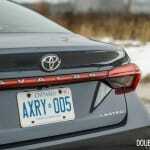 Rated economy is 10.9L/100KM in the city, and 7.6L/100KM on the highway. 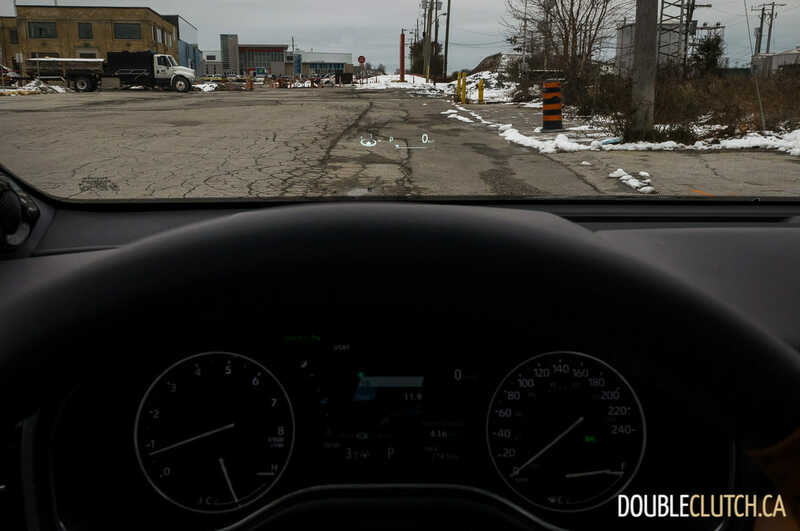 Observed economy after a week of testing came out at 11.8L/100KM, but this involved a lot of dense urban driving and blustery Canadian winter weather. 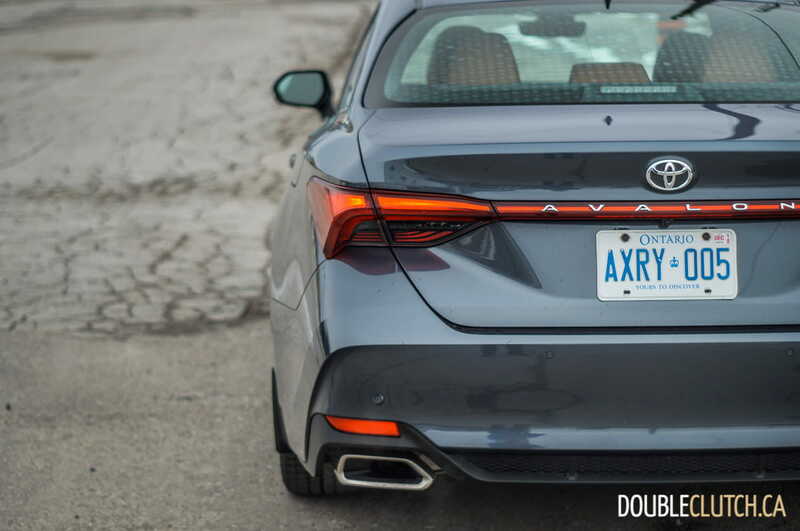 In more optimal conditions, expect the Avalon to meet the rated figures pretty easily. 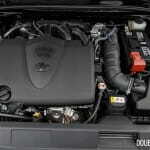 Tank capacity is 60 litres, and regular octane is perfectly acceptable. 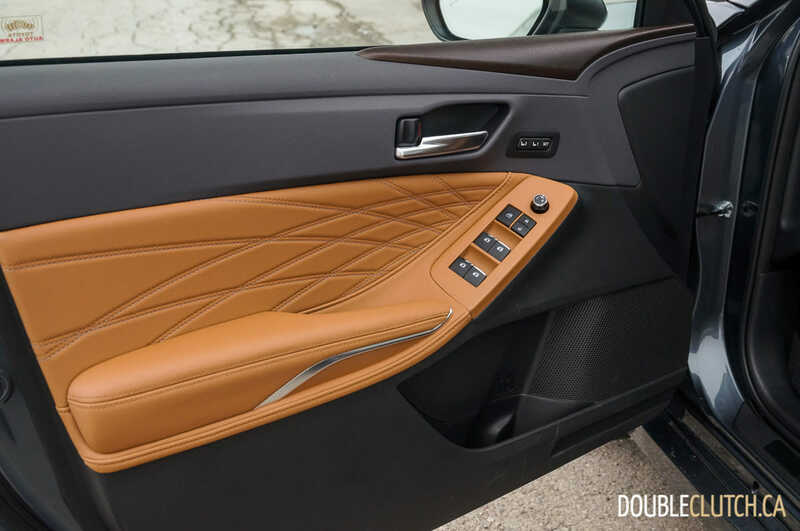 Inside, the Avalon test car came finished in a classy shade called Cognac, which favourably matched the Harbour Grey Metallic paint on the outside. 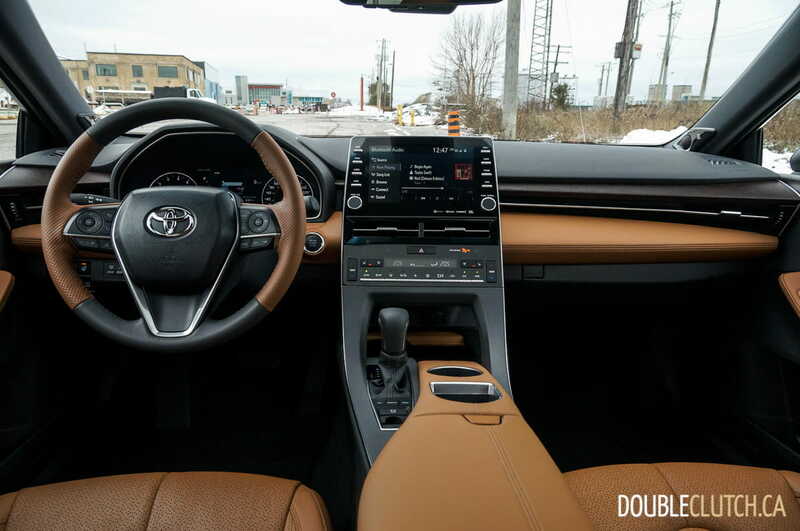 Material quality is noticeably stepped up compared to even the most expensive Camry XLE, with real wood and better soft touch plastics throughout. 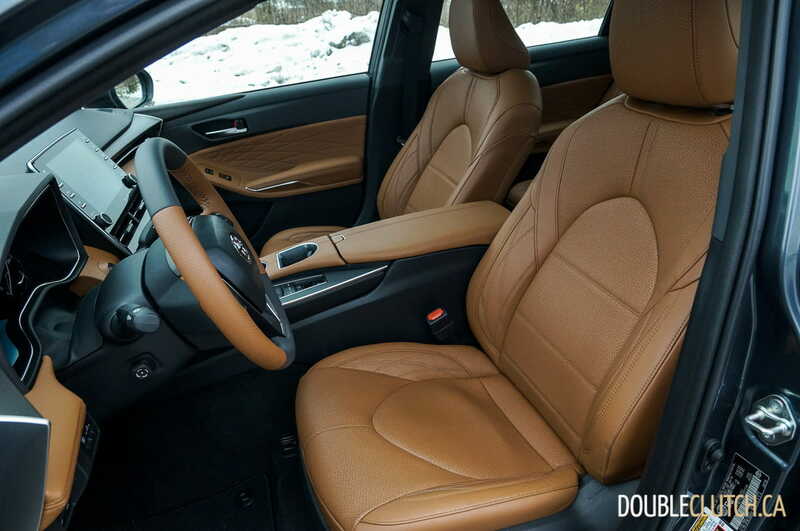 The seats are comfortable and legroom is generous in both the front and rear seats. 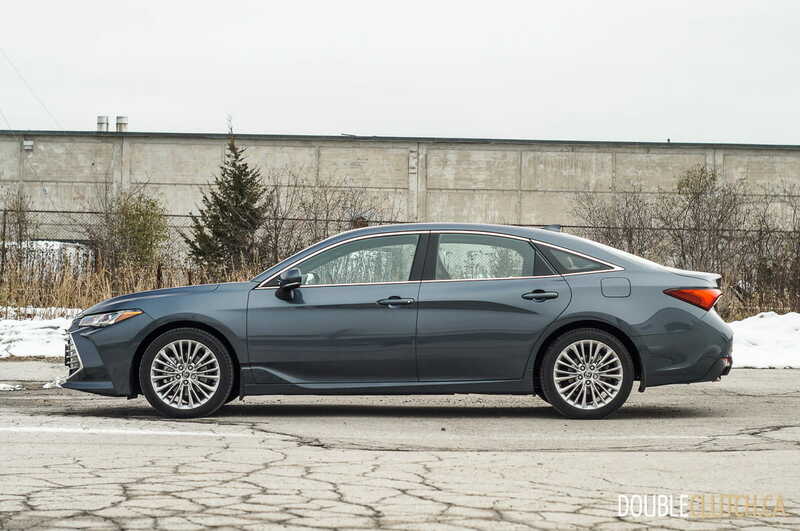 There’s ample trunk space, and the Avalon should be no problem for a family of four. 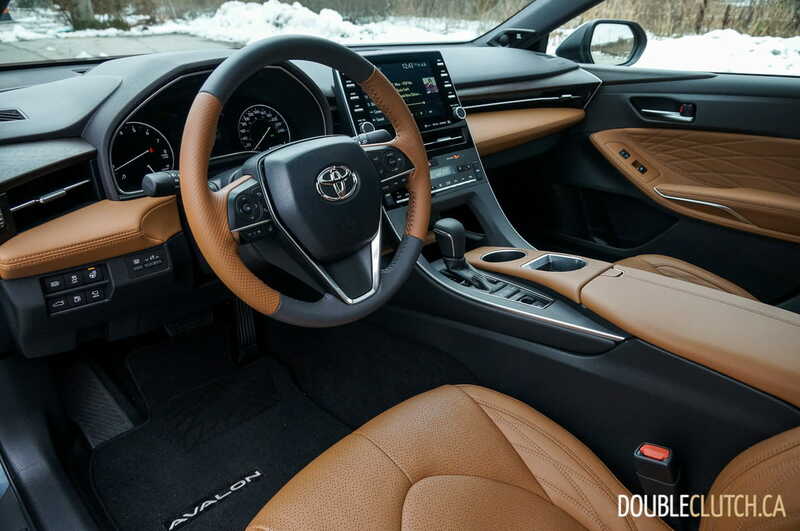 In the technology department, the Avalon does well with its 9-inch touch screen interface. 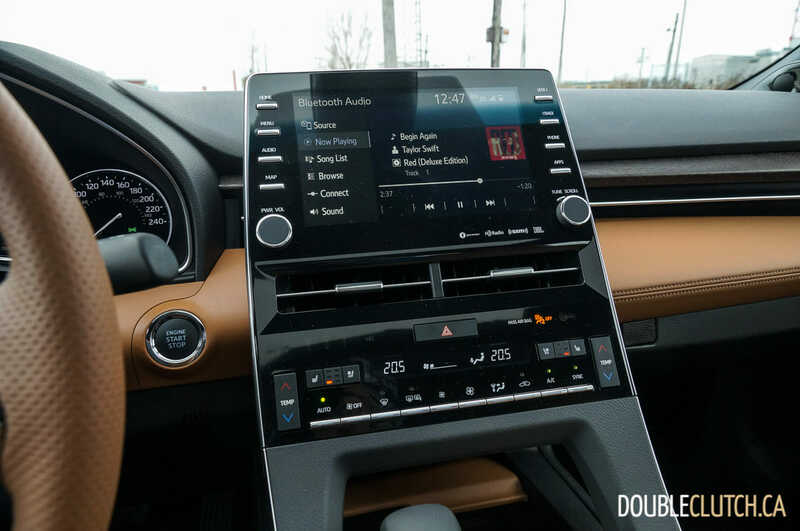 It’s mostly the same software and interface used in Lexus products, but is complemented with plenty of buttons and knobs to make it more ergonomic as opposed to a frustrating touch pad (as seen in the ES 350). 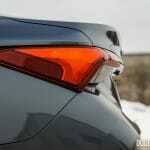 Sound quality from the JBL audio is excellent, carrying a big punch with good clarity. 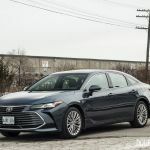 For 2019, Toyota has included Apple CarPlay along with their in-house Entune suite, which isn’t bad, but cannot hold a candle to the industry standard. 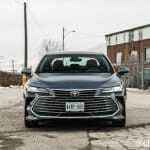 Despite having nearly half of all smartphone operating system market share, Android users are out of luck, with Android Auto not available. 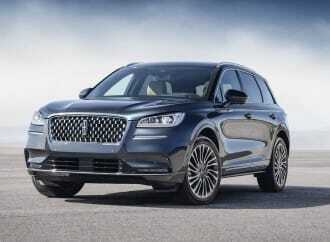 For these users, conventional Bluetooth phone and audio streaming must do. 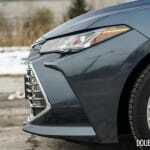 While many buyers are flocking toward crossover sport utilities, the 2019 Toyota Avalon Limited makes a very convincing argument to stay with a conventional sedan. 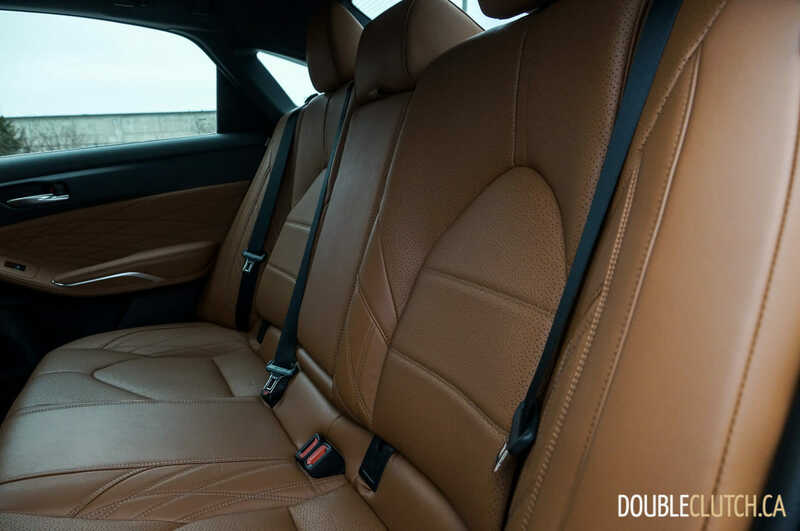 Its road handling and driving dynamics would match that of a much sportier car from only a few short years ago, and the interior is a great place to spend time, with plenty of room for people and cargo. 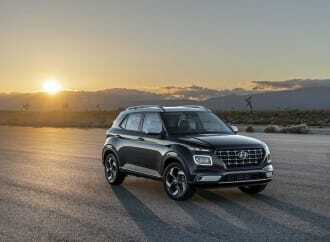 It is one of the better choices out there for cruising on the open road, and while the price approaches $50,000, it’s well worth it compared to other offerings in the class. 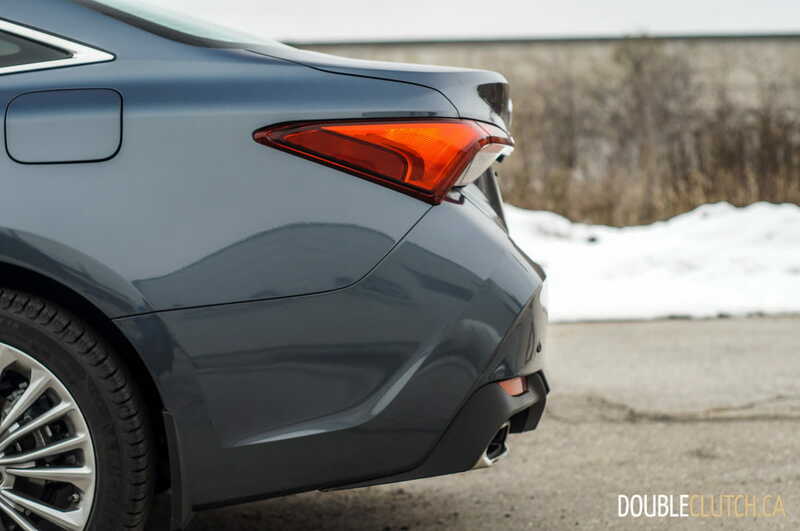 While competitors like the Buick Regal and Acura TLX (reviewed here) come with all-wheel drive, the Avalon does its very best with front-wheel drive – a good set of winter tires will go a long way compared to driving all four wheels with lesser tires that won’t steer or stop. 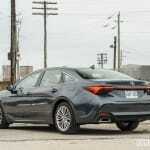 Gone is the Avalon of days gone by; it now can be legitimate fun behind the wheel, yet still does all the things that the Avalon was always good at.